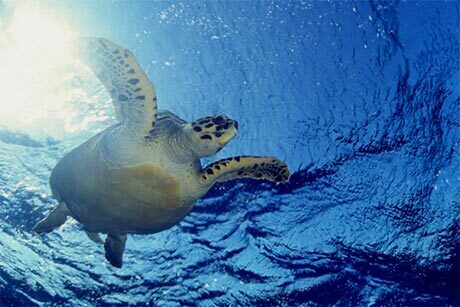 Welcome to SCUBA News. I hope you find it useful. We love hearing from you - any questions or recommendations email news@scubatravel.co.uk. You can download a pdf version of SCUBA News here. Cage Diving with Great White Sharks - Should you do it? Malaysia has some world class diving, including the famous Sipadan which is currently rated the best dive in the world! Who to Dive with In Sharm El-Sheikh? From Sharm El-Sheikh you can visit some world class diving areas in the Red Sea. They have massively improved security at the airport and you can now fly there from most countries. Who to dive with when you get there? 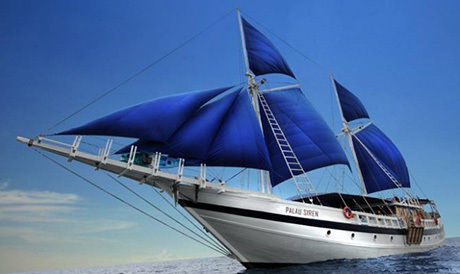 Join the Palau Siren and witness one of the most spectacular natural events on earth - the Red Snapper spawning. Huge aggregations of Red Snapper rise from the deep to mate on just a few days a year. Cage diving with sharks gives a chance to see these beautiful animals up close. However, it is controversial. 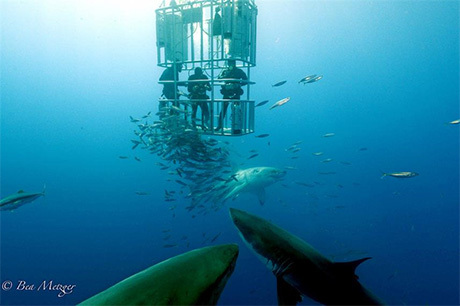 There are concerns that cage diving will alter the sharks' patterns of behaviour and lead them to associate humans with food. 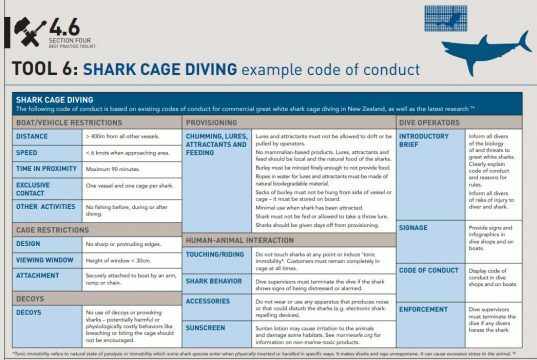 Indeed, New Zealand courts recently ruled that shark cage diving is an offence under the Wildlife Act. Scientific research on cage diving, though, concludes that the effect of cage diving is positive for the sharks, the environment and the local people - provided the dive operators conform to codes of behaviour. In February of this year researchers published a paper investigating the attitudes and environmental behaviour of 136 wildlife tourists following a white shark cage-dive experience in South Australia. They found a positive shift in divers' understanding, awareness, attitudes and concern for sharks following the trip with a significant increase in participation for seven of the eight conservation-related behaviours explored. Previous research has found that there is no evidence to link shark cage diving operations and risk to bathers from shark attacks. The value of shark cage diving to local economies has been variously estimated at between USD 1.3 to 18 million. The WWF, Project Aware and the Manta Trust have produced a Guide to shark and ray tourism, which includes guidelines for responsible shark cage diving. 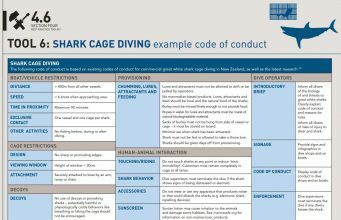 If you do choose to partake in shark cage diving, ask your chosen operator about their code of conduct before booking. No provoking potentially harmful or physiologically costly behaviors like breaching or biting the cage. Lures and attractants must not be allowed to drift or be pulled by operators. No mammalian-based products. Lures and attractants should be local and the natural food of the sharks. Chum must be minced finely enough to not provide food. Where to Cage Dive with White Sharks? White shark shark cage-diving is currently available in only a four countries: USA (California's Farallon Islands), Mexico (Guadalupe Island), South Africa (various sites) and South Australia (Neptune Island). It occurs in areas where the sharks naturally gather, for example around seal and sealion colonies. Two areas: Guadalupe Island and the Farallon Islands have banned the use of all chum (also known as burley, which is bait comprising fish parts, bone and blood used to attract white sharks). Shark cage diving in Mexico is only permitted within the Guadalupe Island Biosphere Reserve some 260 km off the mainland coast. Guadalupe Island is approximately 35 km in length and cage diving operations are specifically restricted to a 6km stretch of coast (607 ha area) on the northeast side of the island to minimise impacts on white sharks, by providing areas where sharks reside without being exposed to operations, and for ease of compliance monitoring. White shark cage diving in Australian waters is currently only permitted within the Neptune Islands Group (Ron and Valerie Taylor) Marine Park in South Australia. The remote location helps to reduce conflict with other marine-based activities. Shark cage diving at the Neptune Islands is restricted to three licensees and is based on two business models - regular day-trips to the site (two operators) and extended multi-day trips that that often combines shark cage diving with other wildlife viewing opportunities. Cage diving activities occur year-round , however, the number of days when shark cage dive operations are permitted is currently limited to 10 days in any fortnight so as to provide regular operation-free days at the site where sharks are not exposed to cage diving activities. South Africa has the most extensive white shark cage dive industry in terms of both number of operators and the number of sites where the industry is allowed to operate.Dive sites are typically close to shore (less than 10 km away). Seal Island at Mossel Bay is only 700 m offshore from the nearest populated centre. Cage-diving is all surface-based and cages are required to be fixed to the attending vessel by rope and at no more than 300 mm from the cage dive vessel. Similar to other jurisdictions, chum and tethered baits are restricted to fish-based products with a maximum daily limit of 25 kg. Bait handlers must not encourage sharks to ingest baits and sharks are not allowed to be intentionally fed. Presenting baits from cages is not permitted. Provisions exist for operators to tow decoys to elicit breaching behaviour in sharks. Commercial operations at the Farallon Islands, California, are primarily based on day trips. Vessels either anchor using tethered decoys to attract sharks or patrol the island area looking for natural predatory events. What do you think? Would you cage dive with sharks? Have you cage dived with sharks? Would you do it again? What do you think about the activity? Let me know. Would absolutely love to do it, in fact I'd intended to go as my 50th birthday present to myself (but that came and went!). However, for many years I poopoo-ed it, saying "Oh, it's only for testosterone-poisoned idiots who want to boast they've dived with Great Whites, they won't actually let on they were in a cage dangling at the surface off the back of a boat" but I (pretty much) woke up one day thinking "OMG, Wow, Cage-diving with Great Whites! I have GOT TO do that!!!". White shark cage diving in Australian waters...extended multi-day trips that that often combines shark cage diving with other wildlife viewing opportunities. Apps, K. Dimmock, K. Huveneers, C. 2018. Turning wildlife experiences into conservation action: Can white shark cage dive tourism influence conservation behaviour? Marine Policy. 88. 108-115. Johnson R and A Kock. 2006. 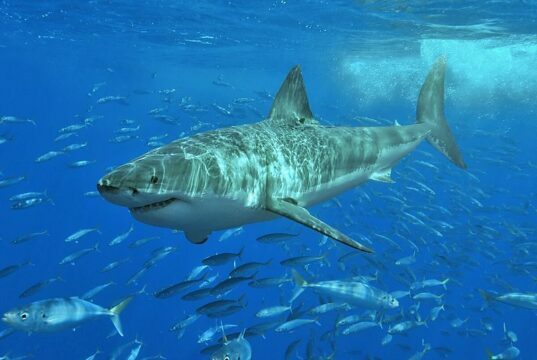 South Africa's White Shark cage-diving industry -id.html is there cause for concern? In Nel DC and Peschak TP (eds) Finding a balance: White shark conservation and recreational safety in the inshore waters of Cape Town, South Africa; proceedings of a specialist workshop. WWF South Africa Report Series -id.html 2006/Marine/001. Bruce 2015. A review of cage diving impacts on white shark behaviour and recommendations for research and the industry's management in New Zealand. Department of Conservation, New Zealand. Launched from San Francisco, the Ocean Cleanup system is heading for a two-week trial before continuing its mission to remove plastic from the Great Pacific Garbage Patch, 1200 nautical miles offshore. The bonnethead shark (Sphyrna tiburo) eats plants as well as meat. A new study demonstrates that the recent mass coral bleaching on the Great Barrier Reef was not restricted to shallow depths, but also affected deep reefs. A trial is underway to restore damaged coral on the Great Barrier Reef using electricity. Teams of divers are painstakingly lifting an artificial reef made of tens of thousands of old car tyres from the seafloor south of France, after it was found to spread pollution from toxic chemicals. Fish had been avoiding the area. Maritime archaeologists found the wreck off the coast of Cascais, near the Portuguese capital, Lisbon. How will key states in the USA fare? SCUBA News is licensed under a Creative Commons Attribution 4.0 Unported License. This means we are happy for you to reuse our material for both commercial and non-commercial use as long as you: credit the name of the author, link back to the SCUBA Travel website and say if you have made any changes. Some of the photos though, might be copyright the photographer. If in doubt please get in touch.